Optimum Nutrition's Essential Amino Energy Fruit Fusion Powder combines an optimal ratio of rapidly absorbed free form amino acids (including BCAAs and arginine), as well as beta alanine and N.O.- boosting ingredients to help you reach your next level. At just 29 calories per serving, Optimum Nutrition Amino Energy makes a big impression without denting your diet. Amino Energy supports recovery before, during & after exercise, and has caffeine from natural sources. Optimum Nutrition Amino Energy Powder Fruit Fusion is rated 4.7 out of 5 by 13. Rated 5 out of 5 by Vness85 from Great Amino Energy I feel really good when I drink this during my workout. It taste amazing I love it. My husband and I highly recommend this product. 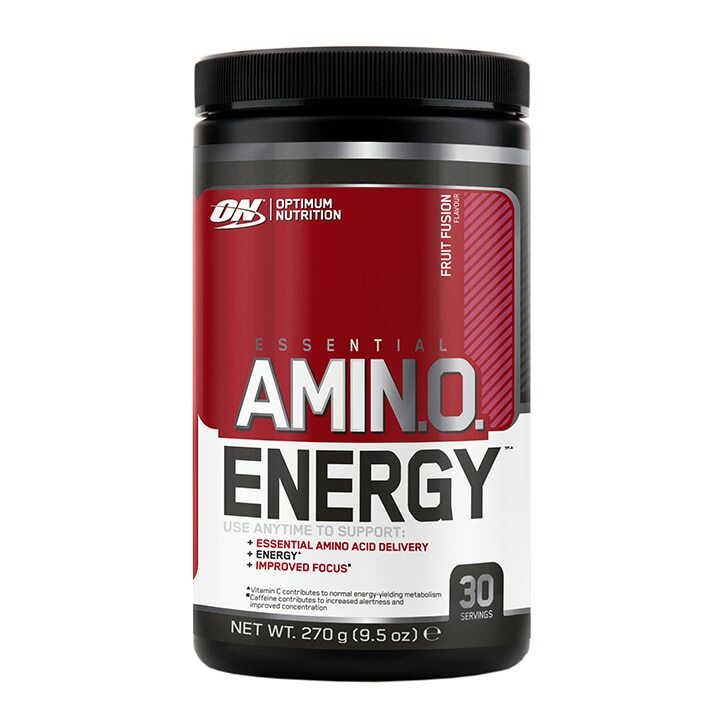 Rated 5 out of 5 by Bahador from Excellent quality I drank Amino Energy during workout first day, gave me energy and I do hard workout without tired. Rated 5 out of 5 by kazzy68 from good stuff but too expensive I have bought this in the past and its great for energy but I can now find it for half this price so they really do need to drop the shocking high price. Rated 5 out of 5 by DM14 from Does the trick I bought this as me & my girlfriend was expecting our first child,& I knew there would be many late sleepless nights, so I use amino energy in morning 5/10 minutes before my workout, it definitely gives you the kick you need,& also gives you a focus when training, great product, definitely recommend.